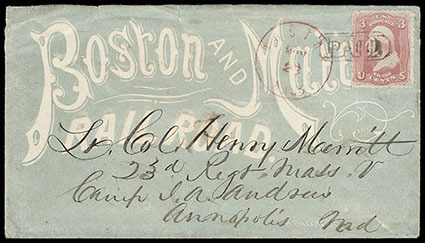 (Railroad) Boston & Maine Railroad, greenish blue allover shaded ad design, on cover franked with 1861, 3¢ rose (tiny margin tear) tied by "Paid" handstamp, red "Boston, Mass., Nov 23" cds alongside, Very Fine. (Schools) Advertising Covers, 1850-1900's, approximately 220 covers mostly illustrated designs and many allover; wide range of schools, colleges, universities and including 1880's Virginia Military Institute (Lexington, Va.) design in different colors, 1860's Notre Dame University, 1893 Stanberry Mo. Normal Business College allover rainbow shaded ad, 1870's Indiana Asbury University (Greencastle, Ind.) and Mexico Academy (Mexico, N.Y.) views, etc., overall Very Fine. 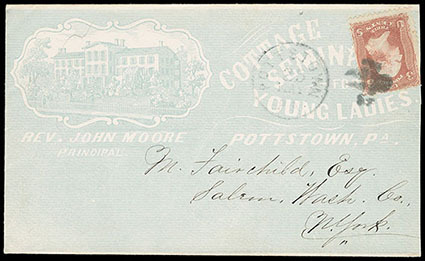 (Schools) St. Mary's Academy, Notre Dame Ind., illustrated advertising cover in orange showing beautiful depiction of school building and trees, flap with embossed "Congregation of the Sisters of the Holy Cross" illustrated seal and Wm. 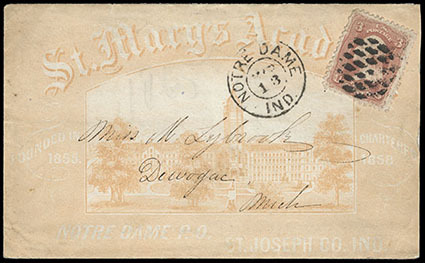 Murphy N.Y. imprint, bearing 3¢ rose (65) cancelled by circular grid cancel, matching "Notre Dame Ind. 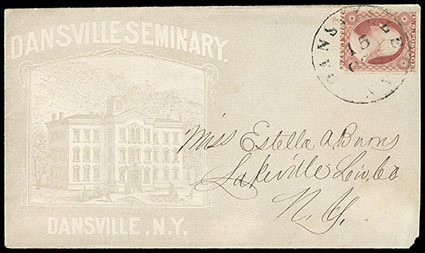 Mar 13" double-circle datestamp to Michigan, original enclosure datelined "St. Mary's March 11th 1865" from a school girl to her classmate expressing hope she will return to school; reduced at right, otherwise Very Fine and rare advertising design. We record one other example of this St. Mary's Academy Notre Dame advertising design in gray that realized $3,186 in the 2018 Faust auction. 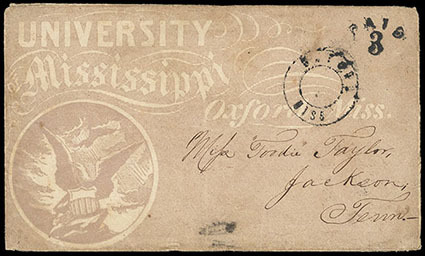 (Schools) University Mississippi, Oxford Miss., purplish brown all-over illustrated shaded ad cover with "Oxford, Miss" double-circle postmark and matching "Paid 3" arc rating handstamp to Jackson Tenn.; some edge wear, F.-V.F. 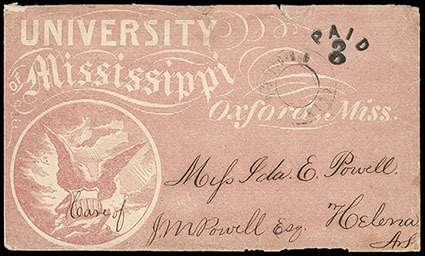 (Schools) University Mississippi, Oxford Miss., red all-over illustrated shaded ad cover with "Oxford, Miss" double-circle postmark and matching "Paid 3" arc rating handstamp to Helena Ark. ; some edge wear and tears, F.-V.F. 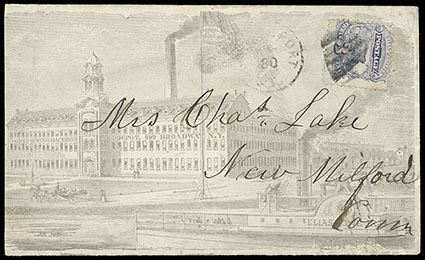 (Sewing) Howe's Sewing Machines Depot, N.Y., gray allover illustrated ad design showing Factory View with "Elias Howe Jr." Steamboat in Foreground, on cover franked with 1869, 3¢ ultramarine tied by "Bridgeport, N.Y., Dec 30" cds and grid duplex, original 1869 enclosure, Very Fine. Elias Howe Jr. was an American inventor best known for his creation of the modern lockstitch sewing machine. (Ship) J.G. 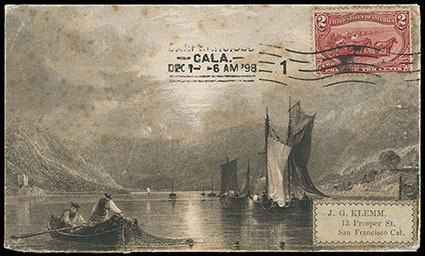 Klemm (Cabinet Maker), San Francisco, address label on handmade cover made from print of Fishing Boats Scene, franked with 2¢ Trans-Miss tied by "San Francisco, Cala., Dec 1, '98" machine postmark; light tone spots, F.-V.F. and unique. Scott No. 286 Estimate $150 - 200. 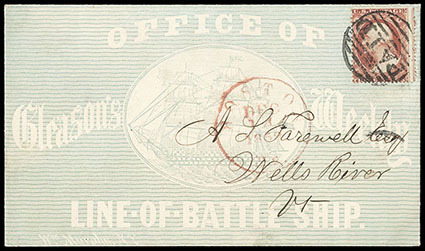 (Ship) Office of Gleason's Weekly, Line-Of-Battle Ship, bluish green illustrated allover design showing Three Mast Battleship, on fresh cover franked with 1857, 3¢ dull red tied by large "Paid" in grid handstamp, red "Boston, Ms., Dec 14, 1859" cds, reverse with embossed "Gleason's Publishing Hall" building on backflap, Extremely Fine and choice, a wonderful and rare allover design in exceptional condition. Scott No. 26 Estimate $300 - 400. 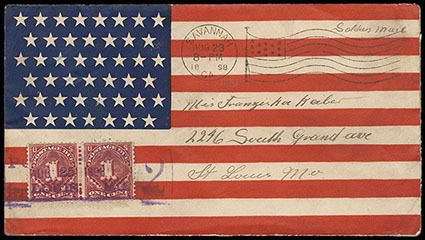 (Spanish-American War) 45-Star Flag, red and blue allover design on cover to St. Louis, Mo., endorsed Soldiers Mail at top, with 1¢ Postage Due pair tied by purple "Postage Due 2, St. Louis, Mo., Aug 25, 1898" date stamp, additional flag machine cancel and R.P.O. transit backstamp, Very Fine. 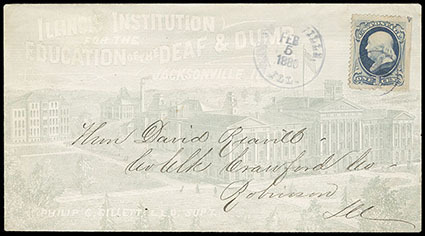 (Stamp Dealer) Chas. 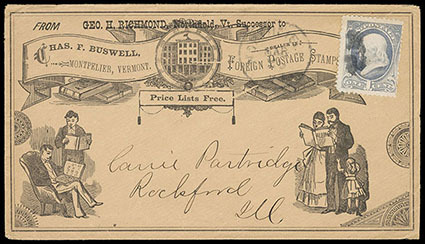 F. Buswell, Dealer in Foreign Postage Stamps, illustrated allover design showing People View Stamp Albums, on fresh unsealed cover to Rockford, Ill., franked with 1881, 1¢ gray blue canceled by cork handstamp, with matching Northfield, Vt. cds alongside, Extremely Fine; with 2013 P.F. certificate.